All Potrero homes currently listed for sale in Potrero as of 04/18/2019 are shown below. You can change the search criteria at any time by pressing the 'Change Search' button below. "Welcome to the Poetrero community! 24410 Highway 94 is a single story home sitting on over 9+ acres of land/meadow. Plenty of land for animals, garden, storage and much more! PAID OFF SOLAR will bring you peace of mind and savings. Two car attached garage and room for RV parking on property. Find the charm within in with the unique fireplaces and wood burning stove throughout the home. Spacious and bright- the living room, dining room, and separate family room will comfortably host your family or company. The kitchen is equipped with granite counter tops, built in oven, stovetop, and hood vent. There is a bonus enclosed sun room that is being used as a gym where you can take in the beautiful views of the country. A gem where you can escape from it all, yet less than an hour away to Chula Vista. Bring your animals, toys and live on your terms. Welcome home." "Welcome to this well loved Park setting property that sits on almost 4 acres. Property includes 3+1 bedrooms, 2.5 bathrooms, 2 bay windows, vaulted ceiling with an open concept, plenty of storage, ceiling fans, kitchen island, and 3 car garage, and RV hookups with separate meter. Enjoy sunsets under the sugar bush tree and plenty places for hiking. Plenty of trees that consist of 13 mature Oaks, 13 baby Oaks, 3 pomegranates, 1 dwarf orange and lemon, 1 grapefruit and a blackberry vein. Neighborhoods: Potrero Equipment: Dryer,Garage Door Opener, Shed(s), Washer, Water Filtration Other Fees: 0 Sewer: Septic Installed Topography: LL"
"An excellent opportunity to own 5 parcels (being sold together) for a total of 178.8 acres. APN #s 654-040-02-00, 654-040-09-00, 654-080-01-00, 654-040-10-00 & 654-040-06-00. Parcels line both sides of State Hwy 94. Includes beautiful mountains, valleys, meadows, stunning views, massive oak trees, awesome granite cliffs, horse & hiking trails. The property backs up against State of California land. State land also alongside this acreage. Electrical power. See supplement. 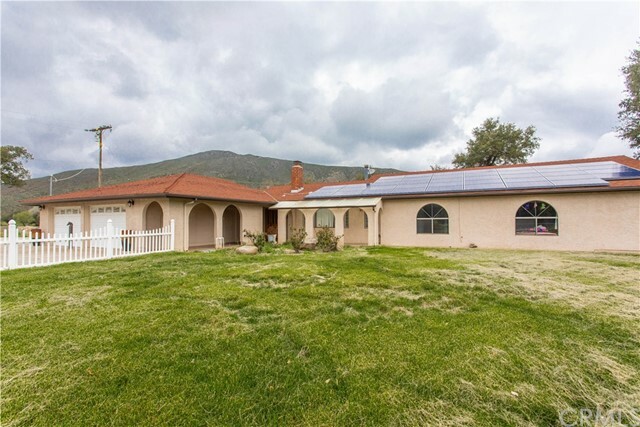 Neighborhoods: Potrero Other Fees: 0"
"Tucked away on nature's doorstep, this 10 acre dream ranch is waiting for you. 2-story immaculate home includes a horse corral and stable. Located in the highly sought after Hartley Hill Ranch area of Potrero, this 3 bed, 2.5 bath 2,128 square foot home is gorgeous! Walk in and immediately feel comfortable with an open layout, raised ceilings that provide lots of natural light. Master bedroom downstairs includes an on-suite which can be used for extra bedroom or office. 600 sqft Granny flat included Neighborhoods: Potrero Other Fees: 0 Sewer: Septic Installed Topography: LL Guest House Est. SQFT: 600"
"Great Property Can be Bought together with Apn 653-130-12-00 for 76 acres Property has lake two wells and a Mobile home in process to be in permanent foundation Neighborhoods: Potrero Other Fees: 0 Sewer: Sewer Available Topography: LL,GSL"
"Your chance to live in a rural community Live in current manufactured home while you build your dream home. Property is set up for horses, with mare barn, arena, two permanent quonset buildings. Great 4.73 useable acres with room build whatever you want. Home has been recently updated with kitchen cabinets, flooring, etc. Great porch area to enjoy the views. Neighborhoods: Potrero Equipment: Range/Oven Other Fees: 0 Sewer: Septic Installed Topography: LL,GSL"
"Must see this investment opportunity! Price to sell! Former Potrero Community Center. This modular property has one big floor plan to design your own ideas. Escape outside with amazing country side 270 degrees views. Total acreage property are 4.01. Neighborhoods: Community Center Other Fees: 0 Sewer: Septic Installed Topography: ,,LL,,GSL"